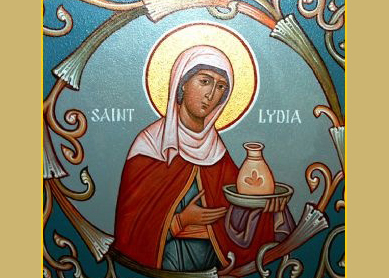 The name, "Lydia", mean that she was from Lydia in Asia Minor. She is also known as “St. Lydia” or even more simply “The Woman of Purple,” Lydia is given other titles: “of Thyatira,” “Purpuraria,” and “of Philippi (‘Philippisia’ in Greek).” . The second comes from the Latin word for purple and relates to her connection with purple dye. Philippi was the city in which Lydia was living when she met St. Paul and his companions. Acts 16 describes Lydia : A certain woman named Lydia, a seller of purple, of the city of Thyatira, one who worshiped God, heard us; whose heart the Lord opened to listen to the things which were spoken by Paul. When she and her household were baptized, she begged us, saying, "If you have judged me to be faithful to the Lord, come into my house, and stay." So she persuaded us. — Acts 16:14-15 World English Bible. Lydia was hospitable to Saint Paul and his companions in Philippi. They stayed with her until their departure, through Amphipolis and Apollonia, to Thessalonica (Acts 16:40-17:1). Paul, Silas, and Timothy traveled through Philippi when they met “a reputable businesswoman and possibly a widow… [who] was a righteous Gentile or ‘God-fearer’ attracted to Judaism”. “[S]he was one of a large group [considered]…sympathizers with Judaism, believers in the one God, but who had not yet become ‘proselytes’ or taken the final step to conversion to Judaism”. “Thyatira in the province of Lydia (located in what is now western Turkey) was famous for the red [variety of purple] dye”. Lydia of Thyatira is most known as a “seller” or merchant of purple cloth. She is known as the “patroness of dyers.” There is a church located in Philippi, which is considered to have been built in St. Lydia’s honor.